Brake Pad Replacement Coupon in San Antonio and More Coupons! 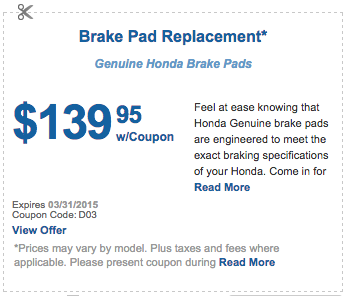 Replace your car’s brake pads for just $139.95 with this coupon! We’ll swap out your old ones with Honda Genuine brake pads to ensure your vehicle stops efficiently whenever you need it to. This coupon is posted above in this blog post, or you can print it off from our specials page! Improve the way your car handles and make your tires last longer with an all-wheel alignment for just $69.95 with the valid coupon from our website. This service includes an inspection of your suspension, steering linkage, and steering pack preload. At Benson Honda, we want you to feel at home at our dealership and at our service center. Our Welcome Home coupon is a way of offering you some hospitality. With this coupon, you’ll get a lube, oil, and filter change, a complimentary alignment diagnostic check, and a car wash all for just $24.95! 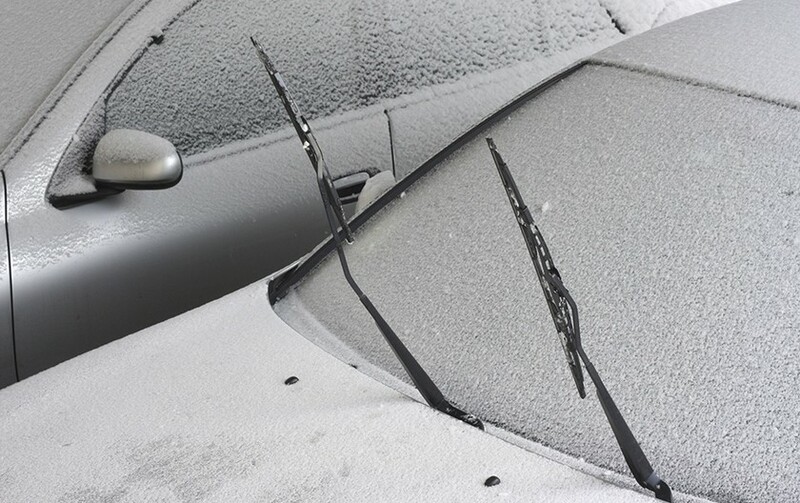 Has it been a while since you changed out your windshield wiper blades? Now’s a great time to get some new ones at Benson Honda! With our current coupon, you can get some new, Honda Genuine wiper inserts for $14.95. These are just a handful of the current coupons we’re offering. Check out our other ones and print yours off today! 1. Put together an emergency kit. If you haven’t already, it’s a good idea to stock your vehicle with a flashlight, some drinking water, a first aid kit, and jumper cables. These items can be useful during any season. 2. Change out your wiper blades. If you know it’s been a couple of years and they’re worn down, change them out. This is an inexpensive way to save you some trouble when rain, snow, and ice try to get in your way on the road. 3. Test out your heating system. Turn on your car’s heat and see how long it takes to warm up the vehicle. Oh, and test out your defogging/defrosting system too. If your heating system doesn’t seem to be in good working order, consider getting it fixed up. 4. Switch out your car’s weak battery. If you’ve had your car’s battery for over four years, it’s probably a good idea to switch it out. Likewise, if you’ve had battery issues recently, or if your vehicle makes hesitation sounds when you start it up, you should consider getting a new battery. Freezing temperatures can be tough on a battery that’s already weak. 5. Take a good look at your tires. Is their tread worn down? Do they look a little deflated? Figure out whether you need new tires now before you get in a tricky situation on an icy road. 6. Think about a wheel alignment. If you notice the way your vehicle handles is a little off, or if you notice your car naturally veers to one side if you’re not careful, you may want to look into a wheel alignment. If your vehicle’s wheels are properly aligned, it’ll perform a lot more responsively on slick or icy roads. Need some extra help with your Honda to help prepare it for winter? Schedule a service appointment with us! This Google Map shows just about all of the car dealerships in San Antonio. Search for San Antonio car dealerships online and you will come up with no shortage of finds. The picture on the right reveals a Google Map of many of the car dealerships in the area. So, with all of the available options, you may be wondering why you should choose Benson Honda for your Auto Repair Service in San Antonio. Well, we have more than just a couple of reasons. Our oil changes are quick, yet efficient at Benson Honda. When it comes to routine maintenance on your car, there is nothing more important than an oil change. Oddly enough, it’s also one of the easiest tasks to complete. 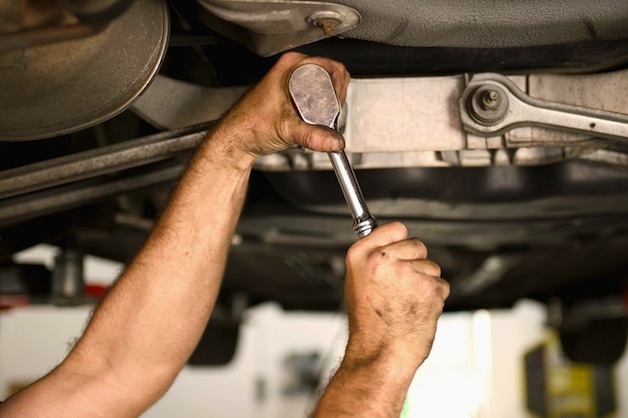 However, if you’ve been taking your car to the corner auto shop, you may feel like the task is much more difficult than it actually is as it takes the shop a couple of hours to finish your car. You also have to call throughout the day to check on the status of your car. That just doesn’t seem right to us. Benson Honda offers a variety of services to San Antonio and all surrounding cities. Where does the used motor oil go?